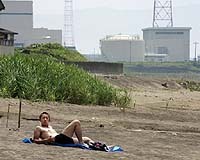 shows a man sunbathing on a beach near Tokyo Electric Power's Kashiwazaki Kaiwa plant (seen in background) in Kashiwazaki, Niigata prefecture, 250 kms north of Tokyo. A powerful 6.8 Richter-scale quake hit the area 16 July, causing smoke to billow out from an electrical facility at the plant and leak radioactive water into the sea. Plant operator Tokyo Electric Power said the radiation from the leaks was far below levels people would naturally breathe in through the air. But authorities have accused the media of exaggerating the risks, tainting the city's image. Photo courtesy AFP. by Harumi OzawaKashiwazaki, Japan (AFP) Aug 07, 2007Staring at the few carefree teenagers frolicking about in the water, beach worker Hitoshi Arakawa was full of resentment over a leak at a nearby nuclear plant. "They say the exposure level won't harm people's health, but the very fact that there was radiation leakage kills businesses like ours," Arakawa said furiously, with unsold stocks of corn piled up under his table. Arakawa, 42, is one of the seasonal workers who set up food and drink booths during the summer on Kujiranami beach, only 10 kilometres (six miles) down the seashore from the world's largest nuclear power plant. A powerful 6.8 Richter-scale quake hit on July 16, causing smoke to billow out from an electrical facility at the Kashiwazaki-Kariwa plant and leaking radioactive water into the Sea of Japan (East Sea).